(Nanowerk Spotlight) A couple of months ago we reported on a nanotechnology breath analyzer for kidney failure developed by a team in Israel that uses networks of carbon nanotubes. Israeli researchers have now demonstrated that an array of chemiresistors based on functionalized gold nanoparticles in combination with pattern recognition methods can distinguish between the breath of lung cancer patients and healthy controls. This sensor may have the potential to form the basis of an inexpensive, non-invasive diagnostic tool for lung cancers. According to the World Health Organization, lung cancer is the leading cancer-related cause of death, accounting for 18 percent of cancer deaths and killing about 1.3 million people worldwide every year. Conventional diagnostic methods for lung cancer occasionally miss tumors and they are costly and unsuitable for widespread screening. Breath testing is a fast, non-invasive diagnostic method that links specific volatile organic compounds (VOCs) in exhaled breath to medical conditions. However, these techniques – gas chromatography/mass spectrometry (GC-MS), ion flow tube mass spectrometry, laser absorption spectrometry, infrared spectroscopy, polymer-coated surface acoustic wave sensors and coated quartz crystal microbalance sensors – are expensive, slow, and require complex instruments. A multidisciplinary research team at Technion - Israel Institute of Technology have now demonstrated a highly sensitive, stable, relatively inexpensive, and fast-response nine-sensor array that consists of gold nanoparticles functionalized with different organic groups that respond to various VOCs that are relevant to lung cancer. The new technique works without the need to pre-treat the exhaled breath in any way. 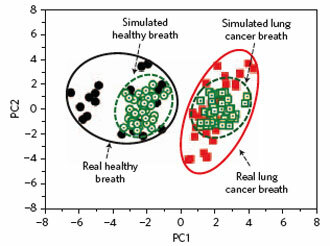 "We selected the organic functionalities on the basis of our identification of 42 lung cancer biomarkers by GC-MS combined with preconcentration techniques," Hossaim Haick, senior lecturer in the Faculty of Chemical Engineering and the Russell Berrie Nanotechnology Institute at Technion, explains to Nanowerk. "We selected five volatile biomarkers, which can be used to train and optimize the array of sensors, to simulate healthy breath and lung cancer breath, Finally we demonstrated that our device has a potential not only to distinguish lung cancer patients from healthy controls, but also to identify different types of primary lung cancer." The breath analyzer designed by Haick and his colleagues consisted of an array of nine cross reactive chemiresistors, in which each sensor was widely responsive to a variety of odorants for the detection of lung cancer. The chemiresistors were based on assemblies of 5 nm gold nanoparticles with different organic functionalities (dodecanethiol, decanethiol, 1-butanethiol, 2-ethylhexanethiol, hexanethiol, tert-dodecanethiol, 4-methoxy-toluenethiol, 2-mercaptobenzoxazole and 11-mercapto-1-undecanol). The team has reported their findings in the August 30, 2009 online issue of Nature Nanotechnology (Diagnosing lung cancer in exhaled breath using gold nanoparticles). According to Haick, chemiresistors based on functionalized gold nanoparticles combine the advantages of organic specificity with the robustness and processability of inorganic materials. In these sensors, the metallic particles provide the electric conductivity and the organic film component provides sites for the sorption of analyte (guest) molecules. When exposed to biomarkers, films with different capping monolayers swell – i.e., the molecularly modified gold particles move apart and, as a result, the resistance of the film increases – differently, due to combination of several factors, including different mass-uptake within the films, different steric interaction between molecules from adjacent gold nanoparticles, disorder within the assembled films of gold-thiol particles, etc. In this architecture, each analyte produces a distinct fingerprint from the array of broadly cross-reactive sensors. This allows to considerably widen the variety of biomarkers to which a given matrix is sensitive, to increase the degree of component identification and, in specific cases, to perform an analysis of individual components in complex multi-component (bio) chemical media. Pattern recognition algorithms can then be used to obtain information on the identity, properties and concentration of the vapor exposed to the sensor array. Using this system, the user gets a figure on the device's display panel that indicates whether the person is healthy or has a cancer. "Our results show great promise for fast, easy, and cost-effective early diagnosis and screening of lung cancer, including different types of primary lung cancer" says Haick. "Our devices are expected to be relatively inexpensive, portable, and amenable to use in widespread screening, making them potentially valuable in saving millions of lives every year. Given the impact of the rising incidence of cancer on health budgets worldwide, the proposed technology will be a significant savings for both private and public health expenditures. The potential exists for using the proposed technology to diagnose other conditions and diseases, which could mean additional cost reductions and enhanced possibilities to save lives." Using the same approach, the Israeli team has been getting promising results for diagnosing other diseases states, such as renal failure. "Using a similar technique, we have been able to sniff-out the unique odor print of in vitro cancer cells," says Haick. "More specifically, in the course of our collaboration with Dr. Nir Peled and Prof. Fred R. Hirsch from the University of Colorado Cancer Center, we have shown an ability to differentiate between the odor prints of in vitro non-small cell lung cancer (NSCLC) and negative controls." These results, which have just been published in Small (Sniffing the Unique 'Odor Print' of Non-Small-Cell Lung Cancer with Gold Nanoparticles), provide a launching pad to initiate a bedside tool which might be able to screen for early stages of lung cancer and allow higher cure rates as well as assuring its complete resection. Haick points out that such a tool might also be used for immediate diagnosis of fresh (frozen) tissues of lung cancer in operating rooms, where a dichotomic diagnosis is crucial to guide surgeons.